On the newest instalment of the Design Football podcast, presenter Jay and his guest, John Devlin from True Colours, discuss the new Southampton third kit which was worn at Bournemouth. It’s something that we certainly enjoy, we must admit, teams being forced to hastily roll out a third kit and this is a classic example, with the obligatory line about how it wouldn’t be sold to the public. They recalled how there had been similar noises made when Liverpool brought out their third kit in December 1993, first wearing it away to Sheffield United on Boxing Day. However, on the pod, Jay and John made the very pertinent point that the kit was too bespoke to have been an emergency run, as most rush-job examples we see are teamwear. As things transpired, it was put on sale and became quite popular. As the programme article mentioned, the kit was worn again in the game away to Southampton, featuring both a shorts- and socks-clash. It was also worn in the game away to Arsenal in March and was retained for the 1994-95 season, too. With Sheffield United having been relegated, there were only two outings in the league (and a pre-season friendly at Bolton Wanderers). The trip to Southampton came at the end of August and Martin Bodenham, who had no problem wearing a similar kit to Aston Villa, sought a change of socks. With Liverpool not having any others available, they took to the field wearing Southampton’s alternative home set, which were mainly used by their goalkeeper, former Liverpool netminder Bruce Grobbelaar. It probably seems unthinkable now, but the gold and black kit remained in use for 1995-96, its third season. Only in its final game, at Arsenal in May, would it be worn in its proper iteration, however. One could strongly argue, in our view, that the green-and-white-quartered away shirt launched in the summer of 1995, provided enough differentiation against red and white stripes, but then our views on clashes are often overlooked. Liverpool were drawn with Sunderland in the second round of the Coca-Cola Cup, the away leg taking place on October 4, and later that month they would make the trip to The Dell. While both the Mackems and the Saints had red and white socks, they both had their usual black shorts. It could have been the case that shorts clashes had to be dealt with in the league cup, but for the Southampton game, Liverpool were also forced to change. With no gold sets produced, the solution – if it can be called that – was to wear the dark green away pairs. 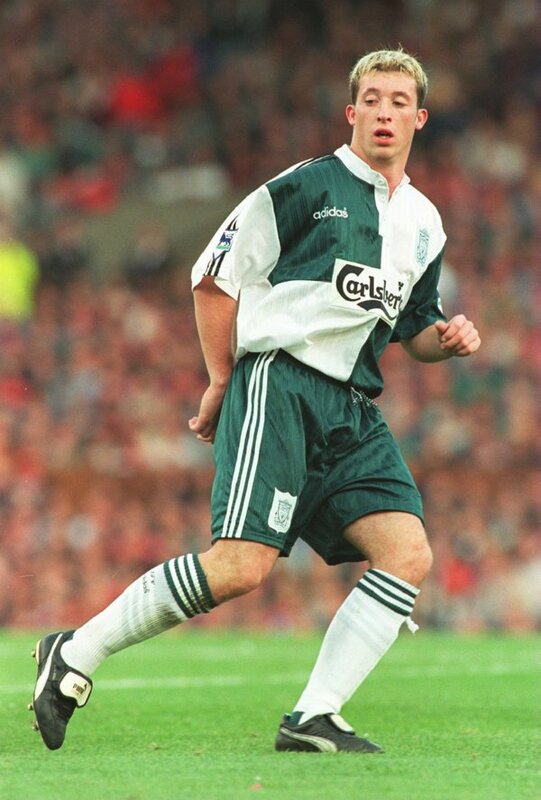 The following season, Liverpool had swapped adidas for Reebok, who supplied them with a cream-coloured away kit (don’t comment saying that it was actually called ‘ecru’; we know, but we choose to ignore). This was allowed to be worn, with change shorts, at both Southampton and Sunderland, and the world continued to turn.